What was your impression of your first GC meeting you attended? I really felt a part of the team! The meeting was very well organized with loads of audience participation. I loved that our CEO, Pat Durocher, was so involved and interactive with the team. Prague – First European city I ever visited. Dubai – Most Western of the 7 Emirates. First time to ever ride in a Rolls Royce, just to get into the helicopter to fly to our suite at Burj Al Arab. Chengdu, Shanghai & Beijing – Conducted site inspections with clients to these 3 cities. It was my first trip to China. 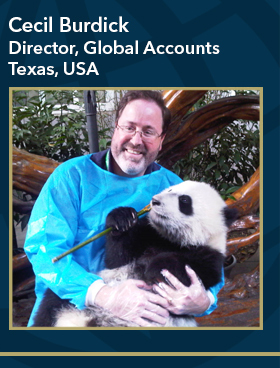 It was also my first (and only) time to ever hold a baby panda. I call this photo “Pandamonium”.